The underlying purpose of this paper is to analyse determining factors of responsible environmental behaviour, which serves as a formative evaluation prior to implementation This comprises the objectives of discussing the project strategy and aims, as well as analysing the target audience’s individual behaviour and conditioning factors deriving from the external situation that require consideration in the design of the project’s implementation strategy. A further implication is to clarify how present theories help to understand factors inhibiting or enabling responsible environmental behaviour and to provide knowledge on communication campaigns and strategy design. The key ﬁndings indicate that theory on individual behaviour change from psychology and social studies is vast, however strategy designers of environmental campaigns do notmake suﬃcient use of it and often develop programmes based on simplistic knowledgeattitude-practice models. On the other hand, literature on external factors determining environmental behaviour is not as advanced, besides the fact that a change of situational terms and conditions is postulated to yield great results. 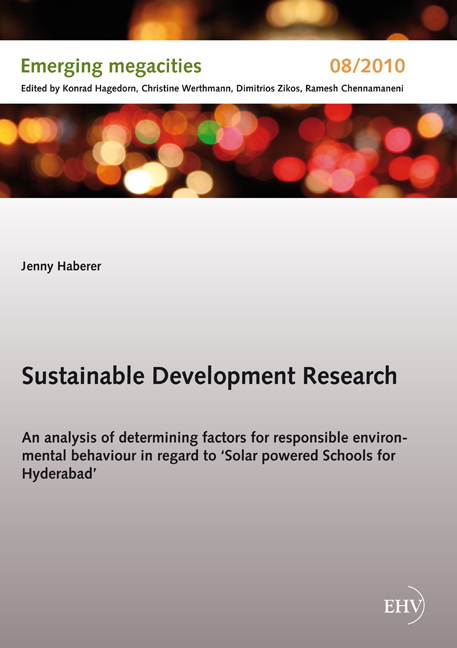 In general, individual and contextual factors need to be addressed to bring about the desired behaviour change, which has been considered in the strategy design of the ‘Solar powered Schools for Hyderabad’ project.